In the previous Blog entry, we discussed the Misdemeanor Offense of Leaving the Scene of a Property Damage Accident (PD). This article will discuss the similar, but more serious Offense of Leaving the Scene of a Personal Injury Accident (PI). 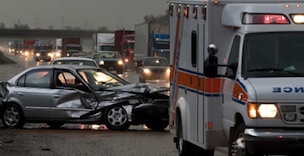 Leaving the Scene of a Personal Injury Accident is typically spoken of as Leaving he Scene of a PI Accident. Like the related charge involving a Property Damage Accident, this Offense and its penalties are set forth in the Michigan Motor Vehicle Code. Leaving the Scene of a PI Accident carries a much stiffer potential penalty, however, of up to 1 year in the County Jail. Again it would seem obvious why this is a Crime. There is a strong public interest in making sure anyone involved in an accident sticks around long enough to exchange information with anyone else involved and summon the Police, if necessary. The stakes are much higher if there is an injury, or even a potential injury. Doesn’t everybody who ever gets a Driver’s License learn that the first thing one should ask, after a collision, is if everyone is all right? Imagine the potential consequences if a Driver leaves the scene of an accident after another person has been injured, and is unable to call for help. Given the stakes, making sure one person renders aid or contacts help for another who has been injured is, and ought to be, a matter of universal public policy. In the real world, this charge comes up when someone collides with another vehicle, or pedestrian, and then panics and takes off. I think it’s fair to say that most of the time this happens, the person who takes off truly believes that the other party is okay. In other words, most of the time, when one person knows they have really banged up another, they’ll stick around and do the right thing. This is not to say that people don’t legitimately and honestly take off from a PI accident out of sheer panic. Of course, if it’s believed the Driver who took off had been drinking, the sympathy factor for that person hovers around a solid “zero.” Negotiations in these cases are exceedingly hard. When the Defense Lawyer can show, or at least convincingly argue, that the Driver who took off was NOT drinking, then the likelihood of working out some kind of deal rises proportionally. Still, though, when its considered from the point of view that a person took off, not knowing whether another person was injured or not, it’s likewise assumed that they didn’t really care all that much, and, in turn, doesn’t deserve much of a break, if any. The job of a Defense Lawyer is to overcome those assumptions and demonstrate that, whatever else, the client was so overcome by panic that for that reason alone, they weren’t able to think with their right mind, and fled. It may sound dire, but unless there is a way to avoid a conviction for this offense, there’s not really much to look forward to. In these situations, absent winning the case completely, a Defense Lawyers real value is in damage-control. Given the general anger toward Drivers who leave the scene of a personal injury accident, every little bit of damage control is profound.